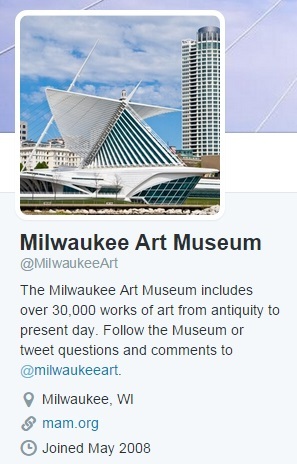 Back in September, the Milwaukee Art Museum participated in International Ask a Curator Day, an online initiative started in 2010 in the UK. The idea? Use social media to open up conversations between visitors and museum staff. This year’s Ask a Curator Day saw an astounding 721 museums from 43 different countries answering visitor questions pretty much around the clock. Of course, we museum staff do this every day on site and online, but we love that Ask a Curator Day gives us the chance to reach a huge virtual audience from all around the world. After the jump, you’ll find some highlights from our Twitter feed on Ask a Curator Day. Thanks to everyone who tweeted us! @ktlwalker From @lisajsutcliffe: I like modern & contemporary art, esp. photography since 1970s. I liked Color Rush and Dirk Skreber. @AlexI3eck From Brandon: I love 19th century art, and 20th century arts & crafts. The Biedermeier and Charles Rohlfs shows were great. @RonRenken @AskACurator Hmmm… interesting thought! @quote_m_unquote Yes, @MilwaukeeArt continues to offer exhibitions and events for all audiences. Our visitors are as diverse as our art. Remember that you can ask our curators questions any day–tweet us, say hello on Facebook, or stop by in person. And we love Ask a Curator so much that we’ve even got an analogue version in our Kohl’s Education Center Lab: Museum Inside Out, on view through November 2. Big thanks to the tireless Mar Dixon for spearheading Ask a Curator Day internationally, and of course thanks to our equally tireless PR Manager, Kristin Settle, and curatorial team here at the Museum for answering questions. We can’t wait for next year! This entry was posted in Behind the Scenes, Curatorial and tagged museum technology. Bookmark the permalink.